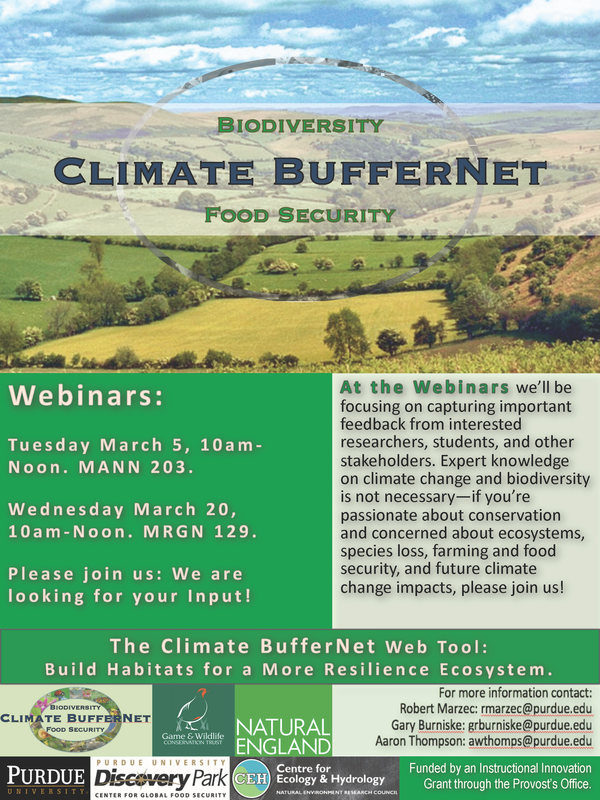 Please mark your calendars and consider joining us in March for two interactive Webinars for the “Climate BufferNet” Research and Education Web Tool. “Climate BufferNet” is an interactive Research and Education Web Tool that visualizes the connections between biodiversity, ecosystem resiliency, climate change, and agriculture. Over the course of the next year our international team of scholars from Natural England, the UK Natural Environment Research Council’s Centre for Ecology & Hydrology, the UK Game and Wildlife Conservation Trust, and Purdue University will be developing the Climate BufferNet Web Tool. Focusing on the importance of buffers—hedgerows, fencerows, pollinator strips, wind breaks, filter strips, upland habitats, etc. on agricultural landscapes—the Web Tool will offer users an interactive, visually dynamic experience demonstrating how habitat and biodiversity conservation can contribute to food security and agricultural productivity in the US and globally. Users will learn about the future impacts of climate change on the provision of ecosystem services on farmlands and on rural landscapes. Through hands-on virtual habitat construction users will learn how to build more resilient landscapes for climate change adaptation and mitigation. Climate BufferNet will be an educational platform that connects researchers, students, extensionists, farmers, and consumers by focusing on the grand twenty-first-century challenges of food security, climate change, and species extinction. At the Webinars we will introduce visual, pre-design conceptions of the Web Tool, and our researchers from the UK will share their knowledge and experience with hedgerow/habitat construction and maintenance, agri-environmental scheme (AES) practices and policies, farming and land management, and perceptions of climate change adaptation and mitigation. As we begin this early-stage work for the construction of the Web Tool we are looking to get ideas and suggestions from the Purdue Community. At the webinars we’ll be focusing on capturing important feedback from interested researchers, students, and other stakeholders. Expert knowledge on climate change and biodiversity is not necessary—if you’re passionate about conservation and concerned about ecosystems, species loss, farming and food security, and future climate change impacts, please join us! We’re looking for your input! Please RSVP Robert Marzec (rmarzec@purdue.edu). The Climate BufferNet Project is supported by an Instructional Innovation Grant from the Provost’s Office of Purdue University.